It’s complicated; but here is a quick summary of what the controversy over genetically modified foods is all about. GM engineering involves reconfiguring the genes in crop plants or adding new genes that have been created in the laboratory. Scientific modification of plants is not something new. Since time began, nature has been modifying plants and animals through natural evolution, meaning that the plants and ani­mals that adapt best to the changing environment survive and pass their genes on to their offspring. Those that are least fit do not survive. Farmers, too, have been helping nature improve crops for generations by saving the seeds of the best tomatoes and apples to use for next year’s crop. This is a kind of genetic selection—the most favorable plants succeed. Seed companies have been contributing to this genetic strengthening, too. Today’s seed catalogs show traditional genetic selection at its finest, promising flowers with bigger blooms, tomatoes that ripen early, and new varieties of old species. Genetic selection has always been cultivated, first by nature and later with help from flower growers and farmers. It’s nature at its best. But here’s the problem—today’s genetic tinkering is not being undertaken by farmers. It is being driven by chemical (i.e., pesticide) manufacturers and plant geneticists, and it is proceeding on a macro scale. The chemical manufacturers’ goal is not to produce a tastier apple, a juicier tomato, or more nourishing corn, but rather to modify food crops, such as corn and soybeans, so that the crops will be resistant to the pesti­cides that these same companies make. Then, when it comes time to weed vast tracts of planted corn or soybeans, the agro-business can spray the pesticide-resistant crops with the chem­ical company’s product to kill the weeds—rather than perform the tedious task of mechanical weeding. The weeds die, the crops live, and the pesticide company makes money. At first glance it appears to be an efficient way to weed a big field. But those crops are our food. They go into the cereals, snacks, and processed products that we and our kids eat. Won’t crop plants absorb some of the pesticides that are sprayed on them while they’re growing—especially if more and stronger pesticides are being used on them? All pesticides and herbicides have potential to be toxic to humans, and espe­cially to children. And what happens when the “survival of the fittest” kicks in? Won’t some weeds figure out how to thwart the herbicides? Will this mean that the industrial farmer has to spray more and stronger herbicides to get the job done? Despite promises by chemical manufacturers that weeds would not become resistant to Roundup (glyphosate, the herbicide most widely used in the United States on genetically modified food crops), resistant weeds are now rampant. It is reported that weeds resistant to Roundup cover more than 100 million acres across several dozen US states. According to the World Health Organization, Roundup is a probable human carcinogen a chemical judged probably capable of causing cancer in humans. To combat the spread of herbicide-resistant weeds, larger and larger quantities of this probable cancer- causing herbicide are now being used. Use of glyphos­ate has increased in the US by 2,500% over the past 25 years. To combat the problem of glyphosate-resistant weeds, chem­ical companies are now engineering GM seeds to withstand not only to glyphosate, but also to be resistant to two additional, older herbicides: 2,4 D (a component of the notorious Agent Orange, used during the Vietnam War to defoliate jungles) and dicamba (a pesticide highly toxic to birds and other living things). These highly toxic chemicals are now beginning to be added into the chemical regimen sprayed on fields of corn, soybeans, and other commercial crops. In turn, US residents can expect that measur­able levels of these toxic chemicals will carry over into the foods produced from these heavily treated crops—with additional chemicals added to pesticide protocols potentially still to come. Chemical manufacturers have long portrayed the goal of GM foods as being the provision of more nutritious crops capable of feeding the world. But a 2016 New York Times report, “Uncertain Harvest,” contested this claim, reporting that GM foods crops have actually failed to increase food production or the robustness of crops being harvested. GM crops have also failed to reduce pesticide use, amounting to another undeliv­ered promise made by pesticide manufacturers. In sum, genetically modified foods are not inherently unhealthy in themselves. The problem is the company they keep—the additional layers of pesticides of ever-increasing toxicity—pesticides that farmers and growers are beholden to because their seeds are genetically modified to accommodate them. As this GM-industrial complex continues to proliferate, the world’s food supply grows increasingly dependent on GM seeds, which in turn increases dependence on chemical fertil­izers and pesticides. These chemicals, as discussed at length, are toxic to humans. Featured image credit: CC0 Public Domain via pxhere. Philip J. Landrigan, MD, M.Sc., is Professor of Pediatrics and Preventive Medicine and Founding Director, Children's Environmental Health Center, Icahn School of Medicine at Mount Sinai Hospital. Mary M. Landrigan, M.P.A., is a health educator who spent 25 years at the Westchester County Department of Health. 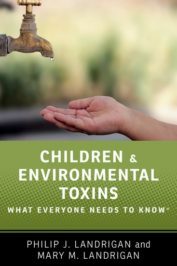 Together, they are the authors of Children and Environmental Toxins: What Everyone Needs to Know, published by Oxford University Press. Interchanging pesticide and herbicides in the top half of the article is deceptive, sensationalist and unprofessional. This is excellent as far as it goes. However it is important to realise that gene editing, as distinct from genetic modification, can enhance crops to make them more drought resilient, pest-resistant or aslt tolerant, thereby reducing the need for the highly toxic and undesirable herbicieds and pesticides you mention. Rothamsted, UK, provides independent information on this. It’s unfortunate that the article only discusses herbicide-resistant GMO modifications, instead of noting the many uses of these new techniques. The promise of GMO technology for plant and animal improvement is ignored here.